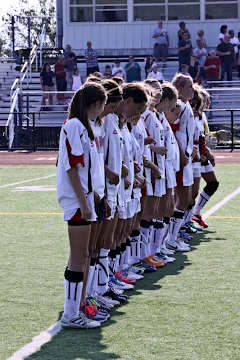 The Whitman Hanson girls soccer team defeated Bridgewater Raynham 3-0 tonight. The Panthers took a 1-0 lead into halftime on a great run, beating the BR defense, and finishing in the right corner. Hatfield continued her dominance as she assisted on Whitman Hanson’s second goal, scored by Yasemine Civan, and then Civan returned the favor assisting on Hatfield’s second goal. The Panther defense led by Alyssa Eaton, Nicole Galewski, Haley Bukow and Nina Zappi kept the BR offense at bay all night. Lauren Clark made 5 saves to record her 4th shutout of the season. Devon Morse, Lily Higgins, Kelsey Murray, and Bridget O’leary all turned in great efforts.